Kaleb and his corrupted twin battle beneath the icy waters. Each knows that his survival will cost the other his life: there can be only one. 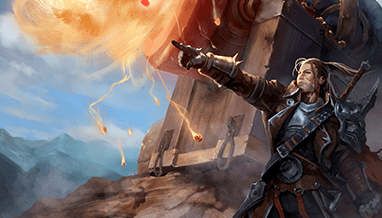 This weekend, join the fray in the There Can Be Only One event! The event comes with a special deck-building rule: your deck can include only one of each non-power card! The There Can Be Only One event costs 2,000 gold or 200 gems to enter. The There Can Be Only One event kicks off on Friday and runs all weekend. Who will emerge victorious? We’ll see you in the game this weekend for the There Can Be Only One event!